We attended the funeral service of a dear sister in Christ who was suddenly taken home at the end of August. She was only 55 years young and was full of life. She had a conversation with her brother the night before she passed and everything seemed normal. She leaves behind a humble and wonderful husband and two grown daughters who are just beginning their lives in the world. Nothing prepared them for this unexpected loss. I was very shocked to hear this news (as many were as well) and could not wrap my mind around the finality of the situation. The funeral service was amazing and celebrated her life in a beautiful way. We arrived early so we had the privilege of finding seats in the middle of the church. When the service was finished, the caretaker announced that the viewing would take place and due to the large crowd, it was best to allow those outside to come in first to pay their last respects. Streams of people walked down the aisle to view the open casket, then turned to acknowledge the family members standing in the front. I was amazed at the multitude of people who were impacted by her life as the viewing took an extra hour to finish. We were in the caravan of cars as we drove slowly to the cemetery site. I have never seen so many people show up for a burial proceeding. As we stood on the grass looking towards the casket, my eyes were fixated on Peter and his girls. In particular, I found my heart drawn to him as I felt deep sadness in my heart for his sudden loss. He stared at the casket and shed his tears. His gaze never broke until the casket was finally lowered into the ground. He and the girls stood up to toss their flowers into the dark pit; everyone followed thereafter with their flowers. Why was I focused on Peter’s reaction? 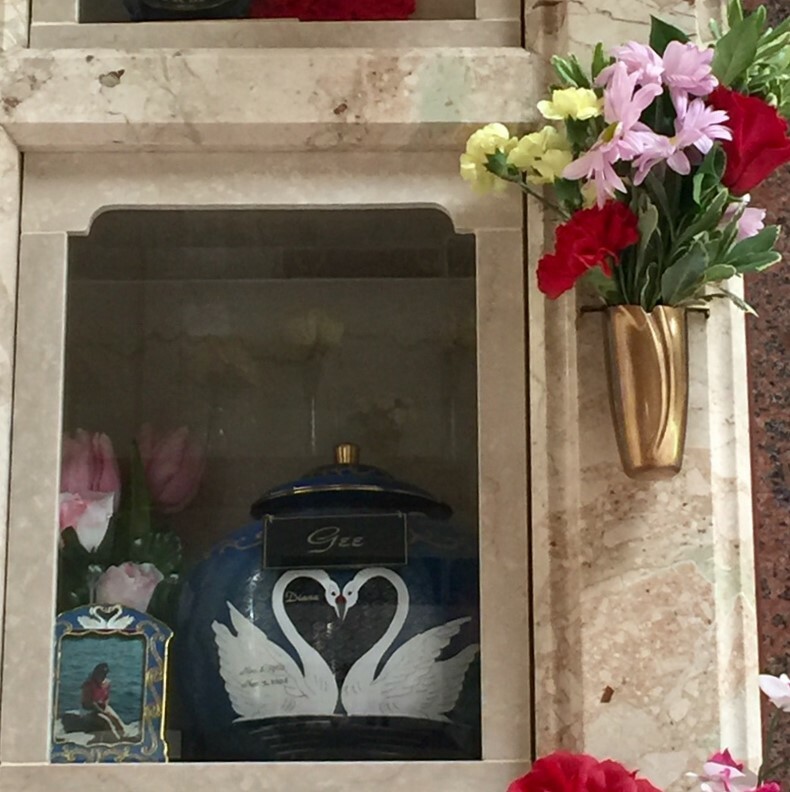 That moment took me back eight years ago when we placed Diana’s ashes into the urn and settled it on the shelf (as the funeral home referred to that space). As Christians, we understand that their souls are no longer here on earth yet one cannot help but feel that sense of loss. I cannot speak for Peter’s emotions that day but I do recall that, until the burial took place (or in my case, the ashes placed into the urn and sealed behind the glass), there was that last bit of unexplained “closeness” I did not want to let go. If only this moment could last a bit longer I thought to myself. That was the familiar look I saw in Peter’s face as he stared at his precious bride’s casket when it was above ground. In those moments, I felt a deep connection to Peter and his loss. It was his last moments with his lovely wife on earth. When the casket was lowered, or in my case, the glass plate was sealed eight years ago, a man’s heart must evolve and deal with the next question in life – How do I move on without her? Just as I have been blessed with a beautiful wife a few years later, I am sure God will help Peter cope with this deep loss and fill his heart again with joy. After all, that was what they would have wanted for us. Pray for Peter and his girls as they transition into a new life. Rest in peace Shirley – we will see you again in Heaven. This entry was posted in Bereavement, Encouragement, God, Journey, Life, Love, Memories, Uncategorized and tagged appreciation, Courage, Family, husband, Loss, Marriage, wife. Bookmark the permalink.